While newcomers normally take a few years to a decade to get where CasinoLuck has managed to reach, it is safe to say that they have earned their current spot despite being a recent release. There are many drivers behind the trend, ranging from their prompt and secure transactions, through the excellent game selection, to player benefits. The CasinoLuck platform was only made available to the public a couple years back but has been in the industry since 1999, under a more traditional design. It has always been known to provide licensed and regulated services and is currently operating under the seal of two of the most renowned online gambling authorities – the UKGC and the MGA. They ensure the operator is fully compliant with industry standards and should not cause any issues to its player base members, in any of the key aspects of its trade. 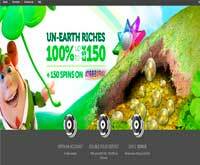 1st Deposit Bonus: 100% up to $£€ 150, plus 150 free spins. Wagering requirements are 35 times the sum of your welcome bonus. Maximum withdrawal for the free spin bonus is $100. Loyalty Program: Yes, a point systen plus monthly cashbacks, VIP live touraments, free games Sunday, higher deposit limits etc. Withdrawal Times: Within 2 business days to process. Zero to 8 days to receive your funds. Language Support: English, Dutch, Svenska, Finnish, German, Suomi, Francais and Norsk. Currency Used In Games: USD, CAD, AUD, DKK, NOK, SEK, Euro, GBP and BRL. Games Available: Blackjack, Roulette, Baccarat, 3 Card Solitaire, Slots, Video Poker, Scratchcards, Keno etc. Slots: Roaming Reels, Crystal Cash, Mayan Gold, Cops’n’Robbers, Trojan Treasure, Diamond Chief, Twice the Money, Safari Spirit, Dream Date, 5x Magic, Ninja Fruit, Illusions 2, Bust The Bank, Queen of Diamonds, Avalon II, Terminator 2, Wings of Cash, Merry Xmas, Monte Carlo etc. Live Gaming: Blackjack & Blackjack VIP, 5 versions of Roulette and Baccarat. Mobile Games: Yes, responsive design to accommodate all mobile devices. Software: Net Entertainment, Microgaming, NYX, Aristocrat, IsoftBet, Lega, QuickSpin, PlaynGo, Evolution Gaming, Betsoft, Bally, Pragmatic Play, WMS, Lightning box, NextGen, Elk Studios and Big Time Gaming. The game selection at CasinoLuck is one of the platform’s strong suits which have enabled players to keep on accessing and promoting the client across mobile and desktop devices alike. This is made possible by the number of leading gaming content providers whose software products are included in the offering. After all, NetEnt, Microgaming, Betsoft Gaming, NextGen, Play’n Go, Aristocrat, Thunderkick and Evolution Gaming, among the rest, have grounds to hold onto in this industry. Players are likely to enjoy sifting through the game selection, both due to the immense variety and the plenty filtering options that allow them to choose between slot types, table games, new releases, and even scratch cards. There is even a Live Dealer casino game section, specifically provided by the developers at Evolution Gaming. A real-life gaming experience is made available to players who enjoy blackjack, roulette, and baccarat in most of their variants, as well as a VIP-status table for the hand grinders. The four-leaf clover is a symbol of the CasinoLuck platform, but they rarely leave their players’ fates to chance. In order to provide them with as many benefits and promotions as possible, CasinoLuck has created and offered numerous different player promotions. Starting off with the bonus for novices and going all the way to the VIP program ranks, players at this casino are able to enjoy the exciting and competitive gameplay. What is more, having their name on the top of the leaderboard is just as good as winning a player benefit, reward or even a trip around the world to see the 7 wonders. Payment processing at CasinoLuck is part of their standard, rather than being an aspect that should be improved. Since its inception, players at this online casino have been able to enjoy fast and reliable payment processing services, with a number of processors doing the transferring. When it comes to deposits, players are open to a myriad of choices at CasinoLuck, starting with the typical debit and credit card processors – Visa and MasterCard, through bank and wire transfers, all the way to more contemporary methods – Sofort, Trustly, Skrill, Neteller, Euteller, Zimpler, Bancontact, eps, PaySafeCard, EntroPay. Due to the site’s international character, some of these methods are more restrictive for specific areas, but most of them offer transactions in the top popular currencies. The same goes for withdrawals, only in this case they are limited to Visa, MasterCard, bank and wire transfers, Trustly, Neteller, Skrill, Instadebit, and EntroPay.